Donna Burke’s voice is well recognised around the world but she is seldom recognised. Living in Tokyo since 1996, the Perth-hailed singer and voice actress is The iDroid in the 100-hour Metal Gear Solid game series, Angela and Claudia in Silent Hill, Dr. Coyle, the ultimate Big Boss for Nintendo’s ARMS and Laura in Fitness Boxing. She’s also notched up millions of YouTube views. ‘Glassy Sky’, which featured in the cult anime Tokyo Ghoul (now on Netflix), has been covered over 20,000 times by fans on YouTube and sampled on Eminem’s Kamikaze album. Last week she performed in the 2019 Metal Gear in Concert in New York, following up with a Los Angeles show on April 6 and Tokyo on May 3. The show features footage from the 30-year old game, with scenes of people fighting or leaping out of planes or getting shot synchronised with a 70-piece orchestra conducted by Australia’s Nicholas Buc. 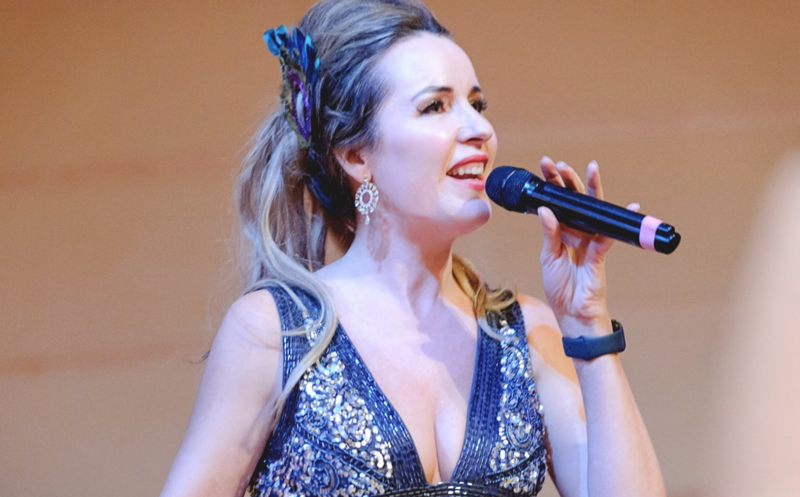 The show allows Burke to sing songs from the games like ‘Sins Of The Father’ (used to promote Metal Gear Solid worldwide), ‘Snake Eater’ and ‘When Heaven’s Divide’ – which she says are great songs and should be in the Top 40 charts around the world. Speaking to TMN after the New York show, Burke said of the audience, “They were very vocal and excited which made it so fun. “I could see them leaning forward in their seats, literally on the edge of their seats with excitement and energy. “I couldn’t see too far out but I could hear them. “They even clapped mid-song at one point! “Japanese audiences are very restrained and the Paris audience more loud, but New Yorkers were hyped and let me know! As a child, Burke could imitate accents, which she honed with drama classes. After a stint as a teacher in Perth, she moved to Tokyo to teach English. But her career took a new direction when she and her husband Bill Benfield started a record label Dagmusic, through which she released an album Lost and Found. She also is the lyricist for numerous Japanese TV commercials, anime songs and J-pop group tunes. Creating voices for games, she is often asked by the producers and co-songwriters for strange interpretations – none more than when she was asked to sing like a dead person. “So I sing without hope, without life yet with regret and some detachment. To psyche up for a show, Burke uses Yamuna balls to stretch her back and whole body, and then an Aussie vocal warm-up app called WarmMeUp. “But once I’m on stand by backstage I make myself cry with gratitude, I whisper ‘Thanks’ over and over to the crowd and to the moment. “I wave my arms around and about dance along to the music being played by the orchestra while singing in harmony. I jump up and down, slap my arms and get all hyped and take lots of deep breaths. She’s not sure if Australia will see 2019 Metal Gear in Concert. “I’d love it to happen but it might be a little too niche. Later this year Nintendo Switch will re-release the 2003 Square Enix Final Fantasy Crystal Chronicles game which features Burke narrating the whole game and singing the opening and closing themes. She’s not giving too much away “but the fans will be in for a treat. “My in-game narration (in an Irish accent courtesy of me mimicking Sister Cecilia at Sienna Ladies College in Doubleview in Perth!) was a career highlight for me in 2003. “And then get to sing the opening and closing theme songs written by Kumi Tanioka, write the lyrics and narrate the whole game? Wow! “I have to tell you I’m beyond excited that the game will be re-released on the Nintendo Switch to a whole new audience’.